Warmer than normal winter weather has spurred the cherry blossoms into bloom, just in time for the Yaedake Cherry Blossom Festival. Northern Okinawa is alive with budding sakura, with more than 30% of the cherry blossoms already showing themselves, and festivals will pay homage over the coming month. 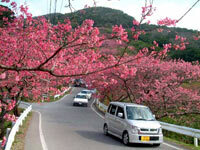 The 30th annual Motobu Yaedake Cherry Blossom Festival begins Sunday, running through February 10th. Yaedake is in northern Okinawa, near Nago City. The Nakijin Castle Cherry Festival runs the same dates as Yaedake, a first for the castle event. For the Okinawa newcomer, cherry blossom festivals rank as one of the most beautiful events of the year, as Mother Nature shows her colors with the traditional flowers. This year’s ‘best viewing’ is projected through the first week of February, although the blossoms will be on trees across Nago and nearby Mount Yaedake through late February. The Nago Cherry Festival comes next weekend, with a full slate of festivities the 26th and 27th. 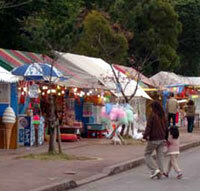 The Yaese Cherry Festival begins the 20th, running through February 10th near the Naha Country Club. The Naha Sakura Matsuri kicks off February 13th for a five-day run in Yogi Park. The Manko Sakura Matsuri in Naha City’s Manko Park along the Kokuba River, is set for February 16th and 17th. All eyes are on Mount Yaedake this weekend, with opening ceremonies at 2 p.m. Saturday, followed by the Miss Sakura Pageant, a cherry blossoms photo contest and the first stage show, with singer Mika Hino, at 4:10 p.m. Visitors can get involved with the program’s street dancing starting at 4:20 p.m., and Ajisai Sound Stage is at 5:10 p.m. Participate in a Flower Viewing Karaoke Contest at 7 p.m., then listen to Hearts Grow Band at 8:30 pm. The Yaedake Cherry Blossom Festival resumes Sunday with a walking contest at 9:30 a.m. and a paper airplane and kite flying competition at 10:30 a.m. The traditional tug-of-war is at noon, followed by a children’s show, the Mannagawa Sisters song and sanshin group on stage at 2:50 p.m., and a taiko drums show with Kadan Otaiko at 3:25 p.m. The 4 p.m. Motobu Folk Song Contest wraps up the festival. Mount Yaedake, the island’s second highest point at 453.4 meters, has more than 4,000 Taiwan cherry trees now opening their blooms. The Yaedake area is also the orchids capital of Okinawa. Cameras are an absolute ‘must’ for the cherry blossom festivals. Nago City’s festival next weekend, the 46th annual event, will have a full round of bands, folksongs, Okinawa dance, taiko drums and more. The last entertainment acts each day are shortly before sunset. Sunday morning is a terrific time for strolling the Nago Castle area, soaking in the cherry blossoms. Festivities are held at the base of Nago castle, the expansive home to the local Aji chieftain in the 14th century. 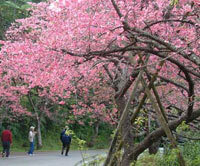 The area is now Nago Central Park, where thousands of Taiwan cherry trees are in full bloom early each year. The forecast this year is for more than 200,000 pink Taiwan cherries to be in full bloom. Sturdy walking shoes or sneakers are recommended for the trek up the well marked and paved roads and walkways to the top of the mountain, where there’s a spectacular view of not only the cherry blossoms, but of Nago and the surrounding waters of the East China Sea. The beauty is free. All else takes yen to purchase. As with all festivals, there are food and beverage vendors, game stands and of course, souvenir booths. This is pretty much a full day excursion, partially because of the activities, but primarily for the traffic. Take the Expressway north to its end, which is Kyodo, just south of Nago. Follow the traffic to Central Nago, and then again as it turns right to Central Park. We recommend parking well away from the festival site, both for cost reasons and ease of getting away when ready to go home. From the bases, plan on 1½ hours minimum to get there, so have the kids visit the bathroom before leaving home. To visit Mount Yaedake, follow the same route, but instead of turning right at Nago Central Park, continue north another kilometer to Prefectural Road 84. Turn left, then follow the English language signs to Mount Yaedake.